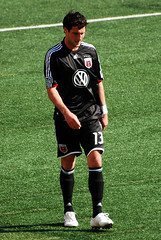 D.C. United last night showed Seattle, on their home turf, that perhaps last year’s U.S. Open Cup Final might have just been a fluke, and Chris Pontius was a huge part of that showing. United continued their unbeaten streak to 4-0-1 in their last five matches, and forward Chris Pontius picked up all three scores in the 3-2 final. Congrats to you, Chris! Well done! Thanks for beating those upstarts out West!